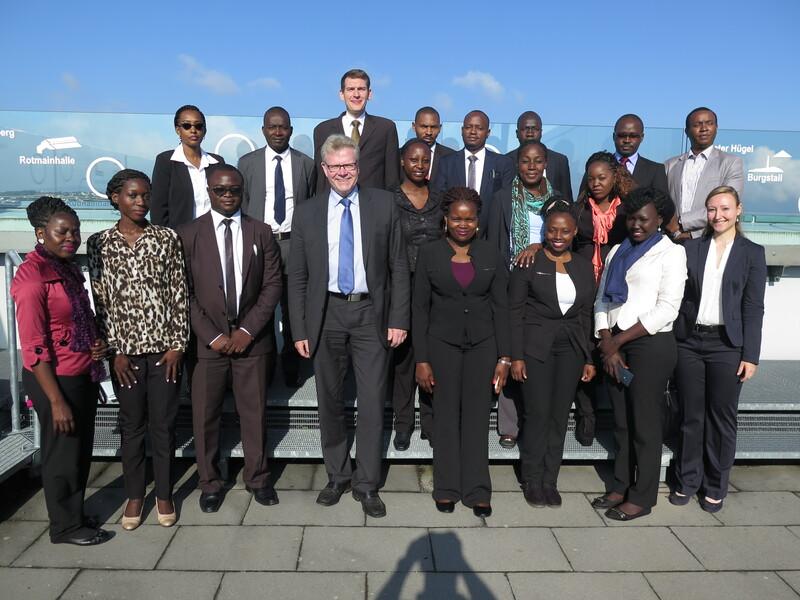 This year, as in previous years, a group of East African master’s and PhD students of law from the Tanzanian-German Centre for Eastern African Legal Studies (TGCL) were able to undertake a study trip from 4 to 16 September 2016 under the leadership of the TGCL manager, Johannes Döveling, visiting first Bayreuth and then Nuremberg, Berlin and Brussels. This study trip to Europe has been an annual event since 2010. It enables the participants to expand their theoretical knowledge and to make comparisons between the legal systems of East Africa and Europe. In addition to lectures on German law at the University of Bayreuth, the programme included visits to the regional court and the district court in Bayreuth, and to the Town Hall, where the Mayor, Thomas Ebersberger, welcomed the students and explained to them how municipal councils function within the German state structure. In Berlin, the students were able to speak with officials at the Federal Foreign Office, the Federal Ministry of Justice and Consumer Protection, and the Federal Ministry of Economic Cooperation and Development. 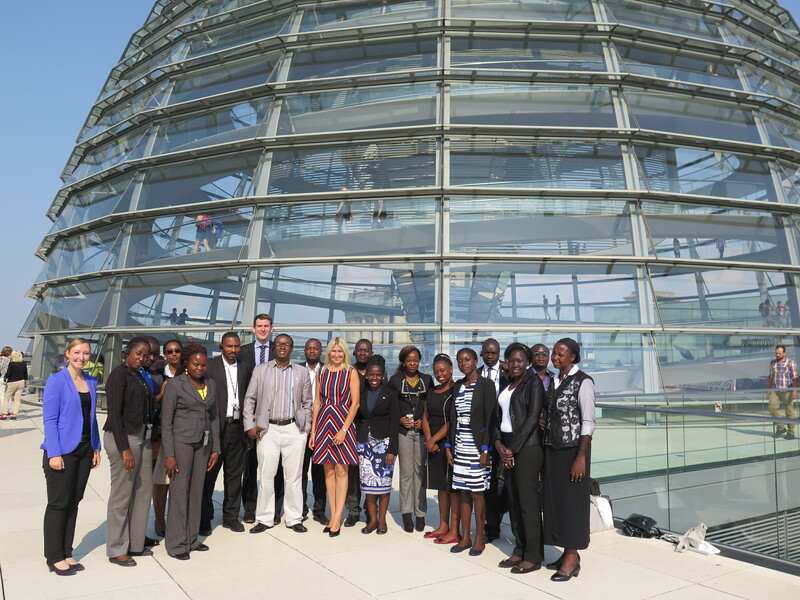 A special highlight was a visit to the German Parliament (Bundestag), where Dr. Silke Launert, a member of the German Parliament, explained to the students how the German Parliament works and engaged in a lively discussion with them. The group also met PhD students from the South African-German Centre for Transnational Criminal Justice at Berlin’s Humboldt University, and were able to exchange views with them and discuss their respective research projects. 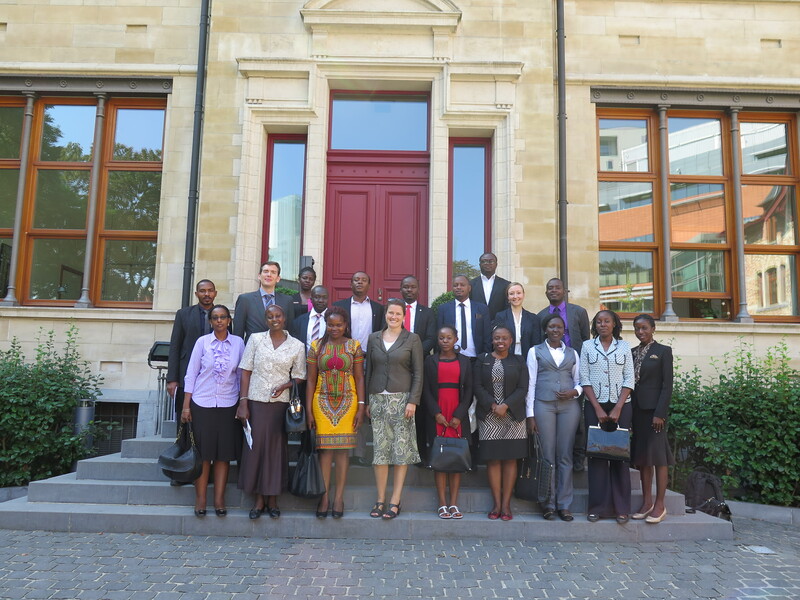 Since 2014, the study trip has also included a visit to Brussels, which allows the students to make direct comparisons between the working of the European Union and that of the East African Community (EAC). In addition to an informative lecture in the European Parliament, the students were given talks at the European Commission on the European Single Market and on Competition Law. They also enjoyed a visit to the Embassy of the Republic of Kenya, where they were received by the Deputy Ambassador, Ms. Mechtilde Musula. She explained the special duties of an East African Ambassador to the European Union, in particular representation on bilateral and multilateral levels. The trip ended with an invitation to visit Transparency International. There, Edward McMillan gave the students an overview of the strategies followed by this NGO for combating corruption. In their feedback, the participants expressed their great satisfaction with the organisation of the study trip. Of particular interest to them was the fact that judges can make their decisions impartially in the pursuit of justice, free of any political influence. In the light of increasing decentralisation, the students also found it very useful to gain insights into the German federal system and the governance structures of multi-level systems.